Cotton, of course, never went away entirely in Heart of Dixie Alabama. It was just put in the shade of soybeans and polyester and such. 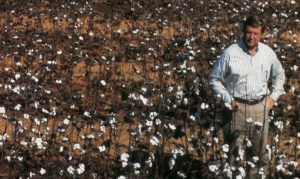 Having peaked in 1949 at 1,925,000 acres, Alabama cotton dipped to a low of 219,000 acres in 1983, according to U.S. Department of Agriculture accounting beginning in 1945. The turnaround came with the collapse of soybean prices and a simultaneous rise in demand for natural fibers. Suddenly U.S. cotton growers could count on a domestic demand (4 million bales) that had textile mills running 24 hours per day for the first time since the 1970s, and to an international demand that had depleted warehouse stocks all over America. In two years, world consumption of cotton had increased from 28 million bales to 35 million bales, with much of the new growth going to emerging textile industries in Asia. Cotton is a primary crop in four areas of Alabama today: along the banks of the Tennessee River, along the Alabama River around Montgomery and west into Dallas County, near Auburn in the Chattahoochee River Valley and in the counties surrounding Atmore in the south. Chris McFadyen is the editorial director of Business Alabama.